This week, while my colleagues were at O’Reilly’s Tools of Change for Publishing conference in New York, I was doing something more prosaic: serving jury duty in Houston. As it turns out, you’re not allowed to drive a drag racer on US federal highways. Who knew? The one thing about jury duty is that even though you can keep trying to get out of it, eventually you’re going to have to do your time. It’s a bit like digital publishing conferences: you can avoid them for only so long. I would have liked to have been at TOC — it was wonderful last year — but, in the end, I didn’t feel too terrible about missing it. After all, there are seven more book conferences in the next few months, five of them focused exclusively on e-books and digital innovation. If you’re not among the already digitally converted — the evangelists, the consultants, and yes, the journalists — who make their profession out of attending such events, then you might be wondering how it is that such people can take so much time away from their regular job. Like jury duty, attending conferences requires that you take off work for several days, travel to an unfamiliar place (who in New York spends time in Midtown hotels other than to attend some kind of conference or have an affair? ), and gather in an dimly lit room with strangers to listen “expert” testimony and then, ultimately, stand in judgment. Sometimes it’s fascinating, sometimes it’s deathly dull; sometimes people say things that make you nod your fiercely in agreement and scribble notes, other times the things that come out of people’s mouths make you feel incredulous. No matter how you feel about it, as the judge reminds you at the start of your jury duty, it’s one of the privileges of living in a democracy. Now, I want you to consider what it would be like if you were required to serve jury duty every week for the next several months.That’s what it currently feels like in the book business right now. Going back to December, there have been three large e-book and tech related conferences in New York City: MediaBistro’s E-book Summit (December), Digital Book World (January), and this week’s O’Reilly’s Tools of Change for Publishing (February). Looking ahead, in March, there’s the Publishing Business Conference & Expo (March) and SXSW Interactive in Austin (March). Then, in April and May, you have the two big English-language publishing conferences, the London Book Fair and BookExpo America, as well as Book Industry Study Group’s Making Information Pay Conference. The book business may be showing only modest growth, but the book conference business is booming. And the trend is not just limited to the United States. In Sao Paolo, Brazil, the first Congresso Internacional do Livro Digital, co-sponsored by the Camara Brasileira do Livro and the Frankfurt Book Fair, takes place March 29-31, and features speakers ranging from Michael Smith of the International Digital Publishing Forum to Pablo Francisco Arrieta Gomes, one of Latin America’s brightest thinkers on e-books. 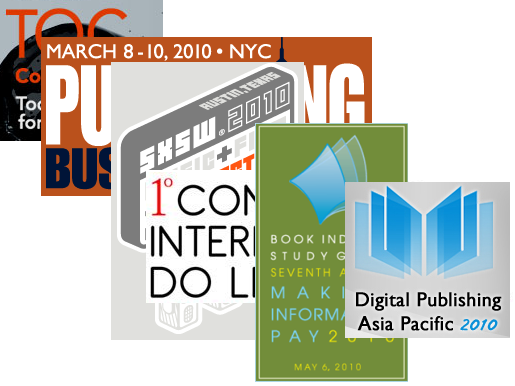 Later this summer, China gets a new e-conference, with the launch of Digital Publishing Asia Pacific 2010, taking place June 9-10, and drawing from many of the talented Asian publishers who may be even further along in e-book adoption than they are in the West. If you were to attend all these events, it would eat up several weeks of your time, tens of thousands of dollars in registration fees and travel expenses. What’s more there’s the inevitable weight gain from neglecting your regular exercise routine and eating all those meals out (not to mention all the cookies and snacks that are available at such events). So, you might ask, what’s the point? Well, as my colleague Hannah Johnson described in yesterday’s coverage of TOC, we’re all still searching for that “aha” moment. Her point, at the end, was that the inspiration comes from within — from a combination of instinct and experience — and the ability to put that into hard work. Conferences, ultimately, provide the raw material for inspiration. Me, I’m packing for next week’s International Publishers Association and Copyright Abu Dhabi Book Fair, where one of the big topics this year is, you guessed it, e-books and the digital publishing revolution. Oh, let me revise that earlier estimate: eight publishing conferences…and counting. Edward Nawotka is the editor-in-chief of Publishing Perspectives. TELL US: About those conferences we forgot to list. DISCUSS: Are conferences creating a de-facto e-book elite?